Premium VR devices like the HTC Vive or Oculus Rift are really a blast. Paired with a good game it’s an incredible and immersive experience. The thing is, you need a powerful computer to use those expensive devices. So how do you go about experiencing the world of VR without dropping half a grand? You could grab a phone VR headset. Phone VR headsets tend to run pretty cheap compared to the aforementioned premium items (and the cheapest options often go on sale for $10 or less). They’re great little devices for experiencing VR for the first time, and almost all phones work with them. At such a low price, you’d think that phone VR headsets would be like gimmicky toys, but they’re actually a whole lot of fun. Plus, the library of VR movies and games for phones is always growing, so a phone VR headset should tide you over until dedicated VR devices are more affordable. 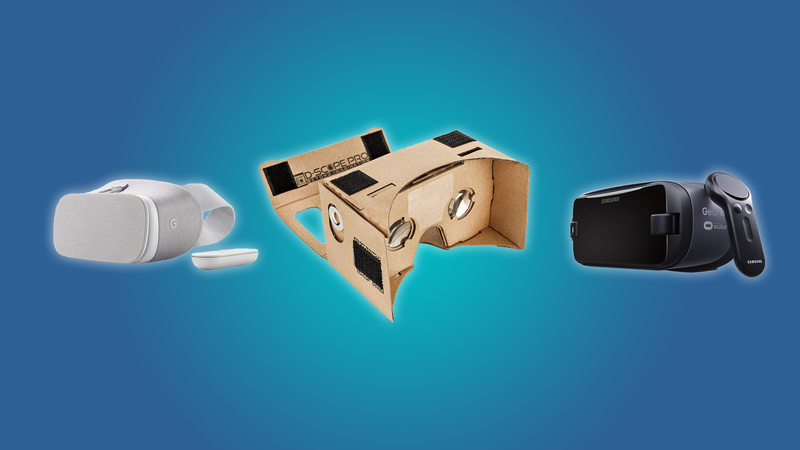 Sadly, it’s difficult to know which phone VR headsets are worth the time of day, and it seems to be even more difficult to tell which headsets your phone will actually fit into. That’s why we’ve taken the time to find the best VR headsets for everybody’s needs, from iPhone to Android users. Keep in mind that all of these headsets have adjustable lenses, but only a couple of them are comfortable to wear with glasses. The Samsung Gear VR has solidified itself as a leader in the world of mobile phone VR, and for good reason. It has a better image quality than most VR phone headsets, and it’s the only phone VR headset that’s compatible with Oculus movies and games. The Gear VR also comes with a super cool and simple controller that can add a layer of immersion to any gaming experience, which is well appreciated when playing the detailed Oculus games. Of course, the Gear VR can only be used with Samsung phones. It’s kind of a bummer, but limiting the Gear VR to Samsung devices allows them to better optimize performance. iPhone owners still have a lot of great options, but only the Gear VR is compatible with Oculus games. If you’re thinking about dropping almost $100 on a VR headset then you should probably take a quick look at the Oculus Go. It’s a standalone device that doesn’t need your phone to operate, but it costs about $80 more than the Gear. The Google Daydream has become a celebrated phone VR headset for it’s stylish, lightweight design and ease of use. You can fit just about any phone inside of the Daydream, as they’re held onto the front by an elastic latch. That being said, you’ll probably experience some light leakage if your phone is too big. Like the Samsung Gear, you can comfortably wear your glasses while using the Daydream.